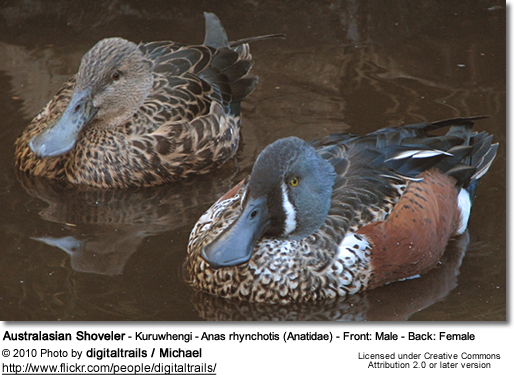 The Australasian Shoveler (Anas rhynchotis) is dabbling duck found in heavily vegetated swamps in southwestern and southeastern Australia, Tasmania, and New Zealand. This endangered species is protected in Australia under the National Parks and Wildlife Act, 1974. The Australasian Shover measures from 46–53 cm in length. The male can be identified by his blue-grey head with a vertical white crescent in front of the eyes. 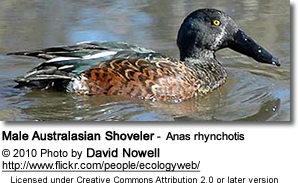 Australian Shoveler Anas rhynchotis rhynchotis - the nominate race - Found in in southwestern and southeastern Australia and Tasmania. 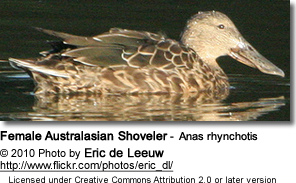 New Zealand Shoveler,Anas rhynchotis variegata - Found in New Zealand.